I was working with the Sports Commission in Lagos when the problem started. I had to leave Lagos and go to my brother’s house at Ibadan. I was there when they killed Aguiyi Ironsi at Fajuyi’s house. Ogundipe made a statement first, asking the whole country to be calm. Within twelve hours, Gowon made his own statement saying that God in His infinite mercies has given the leadership of Nigeria into the hands of a northerner. But Ojukwu said Ogundipe should be the next in line because he’s next to Aguiyi ironsi. They started killing a lot of Igbo officers in 4th battalion and we were also hearing about the killings in the north. My brother was at Ijebu Ode at that time but I told his wife that we have to leave. We moved back to Enugu and I started teaching at Salvation Army Primary School, Ogbete. I was also doing sport because my aim was to represent Biafra in the Commonwealth Games which was about to hold in Kingston, Jamaica. I was already the Nigerian champion in 400 yards, 1964-65. The war was raging. The school where I was teaching became a sort of camp. Some people who came back from the front lost their eyes, some were mutilated. They were telling us the stories, the reality of the war, that it was terrible. In spite of it, a lot of boys wanted to join and it became a sort of fashion to be in the Biafran army. I started asking myself, “What am I doing in the classroom when B54 is bombing Enugu, bombing a lot of places?” So I decided to go for selection as an ordinary soldier. It was at Enugu Garrison and there were hundreds of boys, rows and rows of people. Everybody was struggling to be in the line and when I tried to push myself in, one of the military police flogged me because they said I was causing confusion. It was so funny. He started pursuing me but ran through the elephant grass and disappeared. I went back to teaching. But I saw an advert that Biafra wanted to recruit their first officers. The qualifications were Credit in Maths, English and so on, and I had all of them, so I went for recruitment again. This one was based on ability to run and they took us in about five buses and dropped us twelve kilometres away. We had to run back and I was the second to come into the garrison. The first person was one Mr. Onu, who was a marathon runner. After the obstacle tests and interviews I was selected. We then went for our military training at Enugu Hilltop. Three months later Ojukwu came and commissioned us. We were the first Biafran officers and I was the first army officer from Achina. Because of it, other boys from my town got interested and joined the army. After the training, I went to Afo Ugiri in Mbano to pick my boys because they train the boys elsewhere. When I was inspecting the boys they assigned to me, who did I see standing there? My brother, my immediate seniour brother. That moment, I was almost mentally devastated but I didn’t act as if I knew him. I was saying to myself, “God, how can I take my brother to the war front. Suppose we enter an ambush?” This my brother had been a driver and was not in regular contact with the family so we didn’t know his whereabouts until that day. Later, I called him and asked what motivated him to join the army. He said the boys who joined earlier were always pushing him around and maltreating him as if he’s nothing. That was the first time I regretted entering the army. I called Bernard, my fellow officer, and said to him, “Do you know this man is my brother? Nya nwa soro mu.” [“He’s directly older than me.”] Bernard couldn’t believe it. I told him, “We have to swap. Take him and give me one of your boys.” Bernard took my brother, Isaiah, and I took another boy from Bernard. I didn’t want two of us to die at the same place. And I didn’t want him to influence me. At first, I fought at Ugwu Oba, near Enugu, before I was posted to Port Harcourt under Achuzia. He was a no-nonsense soldier. With him, it’s either you die fighting or you survive. If you show signs of laziness, he’ll shoot you in the leg and tell you to go home and rest. But he was a good fighter and a great leader. He was in charge of Otuocha Brigade and the 18 Battalion, which I fought in, was part of it. The war didn’t get to my village but the effect was still there. I was fighting at Abagana but whenever things were quiet I was seize the opportunity and my driver will drive me home at night. I started seeing changes in my little cousins, nephews, nieces. Their hairs were changing colour and they started getting big stomachs. Sometimes I come with food, but after a day or two it will be finished. One day, I saw eke [python]. I didn’t know what to do because in my place it’s a taboo to kill python. But I said to myself, “My younger ones are dying and this should be a good source of protein.” I killed it with the help of one other boy. We did it at night. My people didn’t know it was eke because I skinned it; you know eke has nice colour – black and white. I told the boy we have to throw away the skin because if they see it, they’ll know it’s eke. We made them drink the stock because that’s where the nutrient is. And nothing has happened to any of us till date. I don’t believe in all those rubbish superstitions. It was at Abagana I sustained this wound. [Indicating his right arm]. We infiltrated their media and got information they were going to attack that day, so we were ready. I went from trench to trench to give orders to my boys. One of them was killed some days before and another was shot at the neck when he was eating, so I knew the person shooting is not far. I called my batman and told him, “Stay here. I want to find out what is happening.” I wanted him to stay at a particular place so that if the guns get stuck he could open and repair them. I had my grenade and my gun and I entered into the front line, gradually…creeping…going. I heard the shooting again and I saw the smoke – whitish. This was the first time I was coming face to face with a Nigerian soldier. When I got to where I knew was a good position, I got up on my hands a bit, the way lizards do. As soon as I lopped, shots burst out. The place was a cassava farm so he must have heard sounds and knew somebody was around. One of the bullets got my hand. I felt a sensation and knew something has happened to my hand. I waited for a while and then my grenade exploded – Gbrrrrrrrrrrr! There was smoke. If I didn’t throw it out it could have exploded and killed me. I waited for a while and when I didn’t hear the gun shots any more I started creeping back. I was using one hand because I thought the other was gone. When I got to where I told my batsman to stay, he wasn’t there. My Second-in-Command appeared immediately. “Oga! Oga! What happened? Look at! Your hands and clothes are full of blood.” As he was tearing my shirt, it became completely dark and that was the last thing I knew. When I opened my eyes it was at Iyienu hospital. I was so thirsty and was asking for water. “Please. Water, water, water.” The nurses got me infused and gave me a sedative and I went to bed again. When I opened my eyes it was at the hospital at Ihiala. I had no feelings in my arm. The nurse sitting near me was my classmate – Caroline. I was looking at her and she looked like an angel. When she saw my eyes open she exclaimed, “Hei! They’re killing all our boys o!” The ward was filled with people, wounded boys, most of them from Abagana. If you go to the mortuary, a lot of dead people. A boy was brought that evening but he died in the night. They left him there till morning. It was normal that people die around you and you stay with them. You don’t feel it. You’re not afraid of it. My hand almost developed gangrene. The doctors carried out three to four operations and each time it will open again and I lose a lot of blood. They wanted to amputate it but Caroline kept pleading that they shouldn’t. The doctors told her to choose one – losing me or me losing my hand. But Caro said they should try one more time. They took me to the theatre again and I slept till 12.00 o’clock the next day. After a week, two weeks, three weeks, one month, there was no bleeding. The wound was healed. I was lucky to have her. I was discharged but I didn’t go back to the army. Instead, I was visiting wounded soldiers in hospitals, to encourage them. My younger brother had a bicycle so he was taking me from Achina to Nkwerre and other hospitals. I was also going to Umuahia to see my girlfriend, *Ruth. I met her when I was a teacher at Enugu. She was really very good to me and I wanted to marry her. When I am going, I buy things for her and the fact that we managed to come on a bicycle to see her, she’ll be so happy. Her family approved of our friendship and the first place I entered when I got my pip as a second Lieutenant was their house. After Umuahia fell, I arranged for her family to move to Achina, so she could be close to me. I was being paid about fifteen pounds and I knew that if Biafra wins the war, I will have a nice position in the army and can start a family. On one of my visits to St. Augustine’s, Nkwerre, I was told that some Red Cross doctors were selecting wounded soldiers for evacuation. I didn’t have my hospital card but one nurse who was a girlfriend to one of my friends told me to try and see the doctors. When it came to my turn, Dr. Jaja, who was a colonel at that time, told the white doctors, “This is one of the cases. We have done our best but we think it’s possible to make the hand to bend.” After examining me, they asked me to come back in two weeks’ time. From there we left for Umuahia to see *Ruth. On our way we saw a lot – dead people, hungry people, those deserting the front, no more very willing to fight. Two weeks later I went back to St. Augustine’s but the lieutenant in charge told me my name was not on the list. But my name was actually there. What happened was that, on one of my visits, I saw a lot of wounded soldiers in front of his office, waiting for him to sign their papers so they can go home. But he was gisting with his girlfriend, so I confronted him. After he gave me the sad news, I left. At Umuahia, a Red Cross car stopped us and a white man came down. He recognized me by my sportswear and said I should have been in Italy for medical treatment. He was surprised when I told him my name wasn’t on the list but he said I should keep reporting at their office. My brother and I went back after a week and met two doctors – Dr. Bakker and Dr. Middlekoop. They said that one patient had died after an amputation, so I would take his place. Then, they asked me what I knew about Holland. I remembered my Geography and told them that the Dutch live under sea level, their farmers wear clogs and the capital is Amsterdam. They were impressed and said I was going to see all those things in reality. Somehow I was sad because of the guy who died but I was also happy. It was providence. When I told *Ruth I was selected, she was very happy but she was worried that when I go abroad I will meet a white lady and forget her. But that wasn’t my intention. A gba nye go m’ ya ola. [I had already given her a ring.] I even bought a fake one for myself and was telling people I was married. The next day I went to Ekwerazu, Mbaise to join other selected soldiers. We were many but eleven of us went to Holland. Some went to Germany, Austria, Denmark, and others a bit further north. We are still in touch, all of us who are alive. Holland was a different environment – from war front to silence and peace. We went straight to the hospital. Everything in the ward was white and clean and I was thinking, “Is this paradise? Am I dead?” It was just like a dream. The following morning, instead of hearing air raids we saw people going about their businesses, riding their bicycles everywhere. From the window, we were just looking. My plan was to go back to the army, not as a combatant, but to join the administration and training. So, after my treatment, I prepared to go back. But the war became very intense and no plane could land at Ulli. They told me to wait. I kept on waiting, till the news came that the war had ended. We were disappointed to hear that Biafra was no more; doesn’t exist anymore. We couldn’t believe it. We never thought Biafra would lose the war. We so believed in it – the efforts we put in, the determination. Anybody who really fought the war with all his mind was disappointed. We were confused and emotional. After everything, we didn’t have anything to show for it. I swore I will never live as a Nigerian. I said it and I still stand on it. 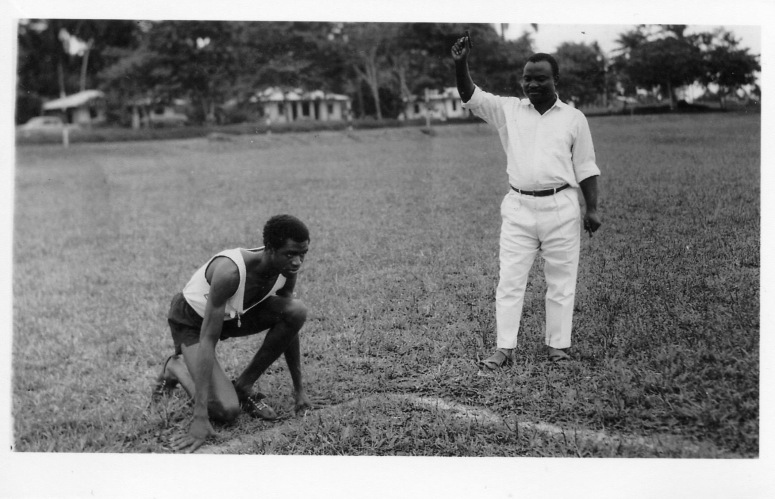 Ben Onwuka was the Nigerian champion in the 400 meters race, 1964-1965. He is an Entomologist, and worked with the Institute for Atomic Sciences in Agriculture, Wageningen, Holland. He is the founder of Omenala, a Foundation whose aim was to propagate African cultures [and the Igbo culture in particular] in Holland, through Music. He was also the President and Activity Coordinator for The International Club, Wageningen, where he was a member for 25 years. He lives in Wageningen, Holland with his family. Read the second part of his story next week.